"With two critically acclaimed independently released studio albums and a live EP, and a tour history which includes Bonnaroo and Bumbershoot, Delfest, the High Sierra and Vancouver Folk Fests and on the road with the likes of Todd Snider and the Wood Brothers, Ashleigh Flynn continues making a name for herself in Americana music. 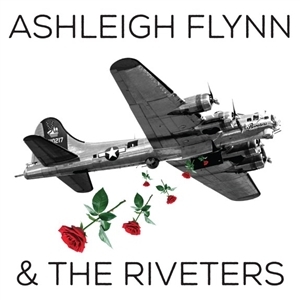 With a fresh slate of songs in her arsenal, Flynns all-female bold new band project, Ashleigh Flynn & the Riveters is in both name and spirit a nod to the "Rosie the Riveter" archetype. Produced by Chris Funk (Decemberists), Ashleigh Flynn & the Riveters features a collection of ten original songs of determination and desire, strength and hope, vengeance and humor. The vinyl component of this release is a gatefold LP package with a collage and epic artwork graphics on the printed sleeve. "Ashleigh's new record is KILLER! She is in top form with one hell of a band."" Oliver Wood/The Wood Brothers"